Panther chameleons are among the most colorful species available. They are nativ2 to Madagascar and have the ability to turn into a wide variety of different colors. Their range of colors is dependant on the area where their line originated. You can find Panther chameleons from breeders although you should always check their reputation. Pet shops tend to carry them as well but you should always watch them eat at least once before buying them. Look for any negative signs while the chameleon is feeding. 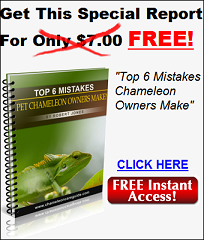 Here are some of the most common questions concerning Panther chameleons. How Big are Panther Chameleons? Males are larger than females, as is the case with most chameleons. Males can reach up to 18 inches and weigh around 160 grams on average while females are generally between 10 – 14 inches and weigh around 80 grams on average. How Long Does a Panther Chameleon Live? This depends on how well they are cared for. If they are put under too much stress then their life span will be substantially lower than average. Under ideal conditions, a Panther chameleon can live up to seven years. What Kind of Cage Should be Used to House a Panther Chameleon? In order to make it easier on a baby Panther chameleon then it should be placed in a small area. An area of 16 x 16 x 20 is the ideal size. Once they reach adulthood then they will need an area of at least 18 x 18 x 36 inches. It's worth noting that these are the absolute minimum sizes. If you can get a bigger area for an adult then that's okay. However, if you want to keep from buying two different habitats, then you can dedicate a smaller area of an adult sized cage for your baby Panther chameleon. Now to address the decorations. You should include nontoxic plants, branches, and artificial vines. Panther chameleons love to climb so anything that offers them the security of being off the ground is great. Finally, screen mesh enclosures are generally a better choice than glass. While you can use a glass aquarium, it must be well ventilated so you would need to use fans to ensure fresh air is constantly pumped into a glass aquarium. How Much Lighting Should be Used? Panther chameleons actually need two different types of light: one for basking and another for UVB. The basking zone needs to be around 100 degrees with an ambient temperature of 75-85 degrees during the day and 65-70 degrees at night. Getting the temperature right is essential since chameleons cannot regulate their own body temperature. They depend on the environment to do it for them. Furthermore, I recommend that you install a thermometer inside of the habitat so that you are not trying to guess what the ambient temperature is. What Kind of Substrate Should be Used? There is varied opinion here. Some people choose to leave it bare for easy cleaning while other people use newspaper or paper towels to line the bottom. Either choice is fine. Just don't use anything that could accidentally be ingested by your chameleon like wood chips. What Does a Panther Chameleon Eat? First of all, all chameleons require a varied diet. While crickets tend to be a Panther Chameleon's preferred choice, you should always feed it several different types of insects. This includes Superworms, waxworms, stick bugs, grasshoppers, hornworms, dried flies, and roaches. Gut loading your insects before offering them as food is important. So what is gut loading? It just means that you feed your insects nutritious foods before offering them to your chameleon. You should also dust your insects with calcium several times a week. If you gut load your insects properly, then dusting with a multivitamin only needs to be done about once a week. For a step-by-step guide to gut loading, check out "Chameleon Care Guide – Keeping & Breeding Healthy Chameleons Made Easy". How Does a Panther Chameleon Drink? Water is the life source of all living things. This is an area where many beginners really mess up. Panther chameleons do not like to drink from a standing water source. They will actually pee and poop in standing water. Chameleons prefer to lick water droplets from leaves. That means you will need to mist the habitat several times a day. Misting has the added benefit of raising the humidity too. You can even install a drip system that provides is a constant supply of nice water droplets. How Often Can a Panther Chameleon be Handled? Panther chameleons like to be left alone so it should not be handled a lot. If you absolutely must handle your chameleon, then you will need to start off slowly by placing your finger in front of it. Allow the chameleon to come to you. 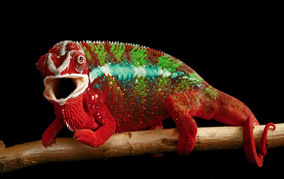 If you are patient in your approach, your chameleon will naturally come to you.